We are now well into the final quarter of 2016 and the end of the year is fast approaching. This is a busy time for us, and surely for you too. In this post we want to give you some sense of how we continue to move the Appogee Leave and Appogee HR applications forward, and how excited we are about what we’ll be releasing over the coming months. We have been full on this year releasing updates and enhancements to both apps. It’s only when you draw them together you can see how far we have progressed, and the great thing about cloud based services is that we can keep on enhancing them without users having to do anything. For both Appogee Leave and Appogee HR we now support directing importing users from your Office 365 active directory. For Appogee Leave we introduced an Outlook add on to allow users to approve/reject requests directly from their inbox, and the option to sync holiday calendars in Appogee Leave with their outlook calendar. This is available in the Office Store. We now support half day public holidays in Appogee Leave, and you can optionally configure the system to carry over holiday “debt” (negative holiday balances) across leave years. In Appogee HR we introduced a sophisticated (but simple to use) report builder to allow HR staff to build custom reports – and we included a starter set of sample reports to get you going. Included with this is the ability to generate alerts, and target those alerts at users in your organization. Building on the above we brought in notifications which can be set up against any date field in the system to support document reviews, anniversaries, pension action dates etc, all of which can apply equally to personal records or company documents. We now offer integration with Xero accounting and payroll, in addition to G Suite (the new name for Google Apps) and Office 365, to make it easier to keep all your systems up to date with user changes and avoid copying and pasting data which slows things down and can introduce errors. 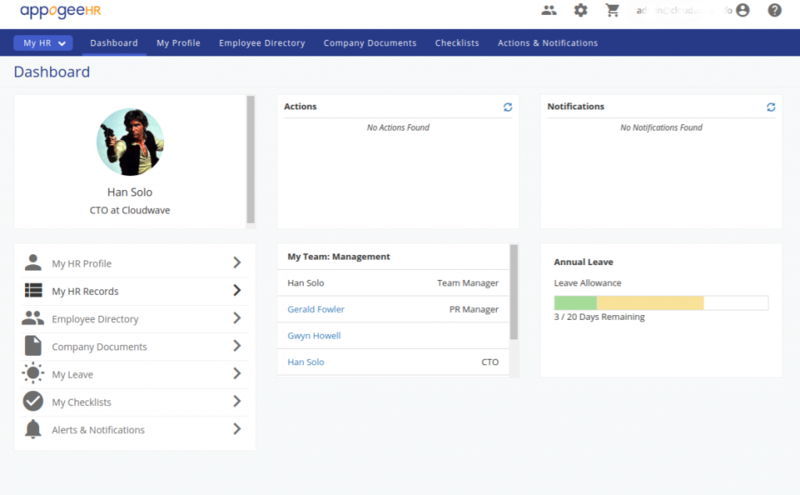 A streamlined user interface across Leave and HR, with a simplified setup and integrated configuration. This will get new users and occasional administrators productive with the system more quickly. Improved auditing so it’s easier to find the history of changes you need for monitoring and troubleshooting. Records monitoring with automated alerting to flag where users may need to update allowances based on other user activity. Added to this we’ll be improving checklists and public holidays profiles, providing better responsive design when using Appogee Leave on a mobile device as well as addressing one of the most requested enhancements – the ability support for length of service increments to leave allowances. Watch out for these improvements coming your way soon. It’s going to be an exciting end to the year and of course there will be many more changes to come in 2017. As always, please do contribute your suggestions and votes to our request boards as it really does drive what we do!